As an in-house leader working with a marketing agency, it can be easy to feel like you don’t know everything that’s going on. You may only hear from the agency a few times a week over email, a call every few weeks, and in-person a few times a year. Unlike the operations that happen within your team, you’re not privy to the day-to-day successes and frustrations that happen while your agency is working towards its goals. Sure, you have the report they give you, but not always the story behind it. That story could very well be the insight that will take your marketing from where it is now to where it could go next. Getting that story from your agency in a respectful, productive way isn’t always easy. On both sides, people are defensive: Your team wants to prove they’re supporting the agency, and the agency wants to convince you of their value. But by approaching these questions with the goal of gaining valuable insight, each side of the equation can benefit from a closer examination of what goes on behind the curtain. Here’s what to ask your agency to get the most value from your behind-the-scenes peek. How Are My People Doing? Agency leaders will tell you that it’s rarely the CMO that holds back a successful marketing campaign. More often, the team members who become the roadblocks are lower down the chain. Maybe it’s a project manager who hasn’t quite kept up with industry best practices, or maybe it’s a technology contact that won’t get on board with a tool implementation. You, as a marketing leader of an in-house team, may never see your staffers in the same context your agency will. The skills of working with an agency are important in other areas of your business: collaboration, communication, and ability to manage investments, for example. You’re not asking your agency to spy on your people. You’re asking for how you can make your team better in order to make the relationship more productive. Maybe it’s about educating that project manager, or re-assigning that technology leader to another team. Seeing your employees through an outsider’s eye is a rare chance to appreciate the strengths of your team, as well. Think about it: Your agency has insight into the marketing successes and failures of all their clients. That’s dozens (if not hundreds) of companies, who are probably in your industry and maybe your competitors. Of course you’re not looking for proprietary information here, and your agency wouldn’t share that. But what your agency can share are broader insights on what has worked and what hasn’t. If you make a technology investment, your agency can tell you what you can expect as far as runway based on their past experiences. Your agency might have stats on their client base as a whole, such as average email open rates, average ad spend for a specific ROI, or how much a client generally has to spend in order to garner the results you’re looking for. If they have other clients like you, your agency is essentially a database of companies just like yours and what has worked for them. It’s a great opportunity to learn everything you can about both the industry and specific instances of success. What Is the Missing Piece in My Marketing? No one likes the upsell. This isn’t about spending more money on peripheral services your agency might offer. 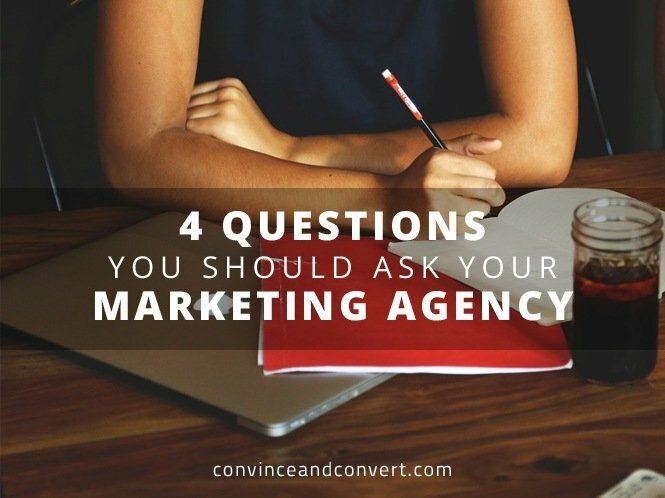 But when you approach your agency with a question like, “What do you offer that I’m not taking advantage of?,” it’s less about getting out the checkbook and more about learning what’s out there. There could very well be a piece of the puzzle that’s holding you back. Maybe you have great text content but are missing the video boat, or maybe you have great graphics but don’t create any long-form content. With your in-house, limited-budget mindset, you might not even agree with what your agency has to say about opportunities to expand your investment. But if a partner who knows your marketing sees an opportunity to supercharge your campaigns, it’s your job to know about it. Yes, you might tip off the sales team with a question like that. If you’re really never going to expand your budget, be clear about that up front. But don’t be so convinced you know everything about your business that you can’t hear your agency’s recommendation about what you’re missing. What Haven’t I Asked You About That I Should? I’ve used this for hundreds of different purposes, and it remains one of my favorites. In many circumstances, we need to be aware that we don’t always know what we don’t know, and I have found this to be particularly true when you are managing an internal team and an agency. When you ask a vendor this question, it opens the door for them to tell you about something they think is important but, for some reason, have not had the opportunity to discuss with you. When you’re working with an agency you trust, there’s no downside to getting the inside look at what your agency thinks about your team and your marketing efforts. The agency gets to show you its complete expertise, including the data it has compiled and success it has accomplished with other clients, as well as the opportunity to remove communication roadblocks or improve difficult relationships. The best part is that you as the marketer receive consulting-style insight into your business and your marketing, all within the bounds of your existing spend.